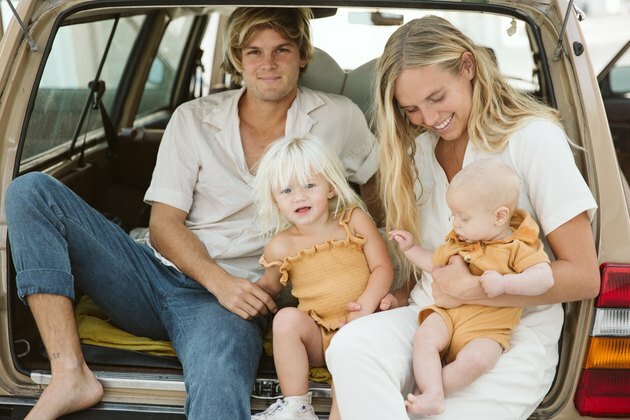 One look at Leah Bradley's Instagram and it's clear — this is a sun-kissed world painted in mustard, dusty rose and sage, anchored by surf and sand, filled with beautiful blondes. 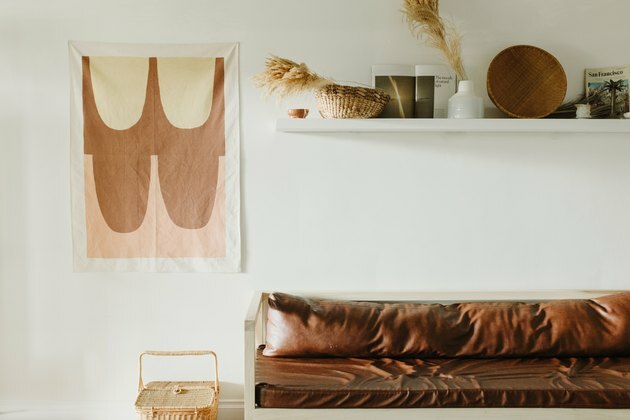 There's an ethereal, Southern-California-in-the-'70s vibe, but Leah's taste — and her home — still manages to feel distinctly modern. Her perfectly curated aesthetic is no accident. 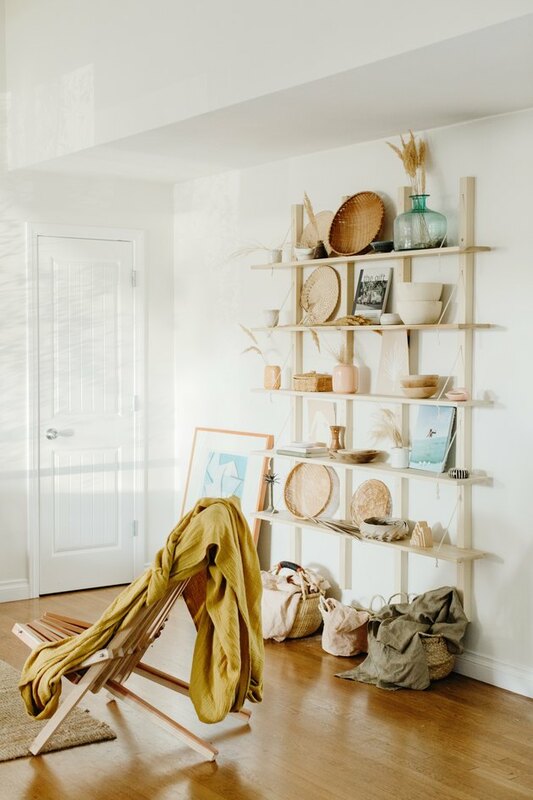 Leah is a stylist, surfer, and owner of Kyst Collective, an online shop specializing in vintage and handmade clothing, much of which is in her signature color palette, as well as home goods. The beach has been central to her entire life. She met her husband, Jakeh, on their high school surf team. "Naturally, we've never strayed far from the beach and love raising our two children the same way we were," she says. 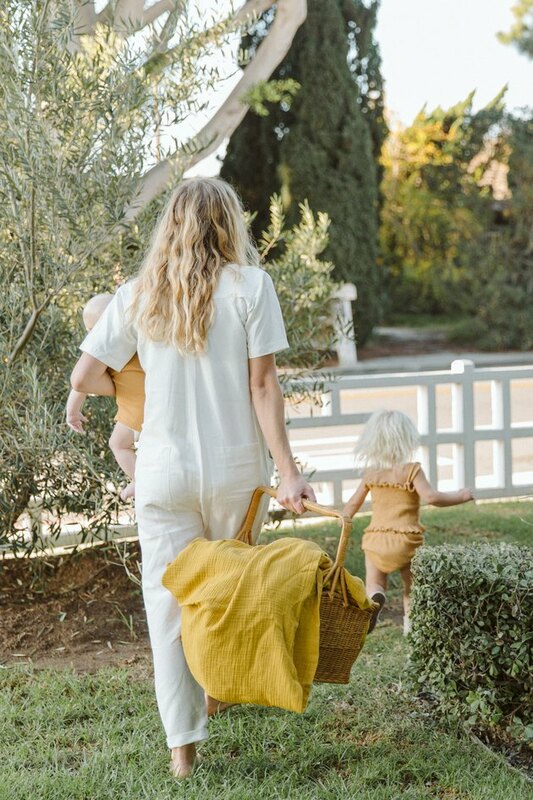 Their petite '50s-era townhome in Newport Beach is just up the road from where Jakeh grew up, in Huntington Beach — and farther up the coast from Cardiff, where Leah was raised, surfing with her father. It's filled with bits and pieces of their life together — from worldly travels to the surf and sand, which is just a bike ride away. 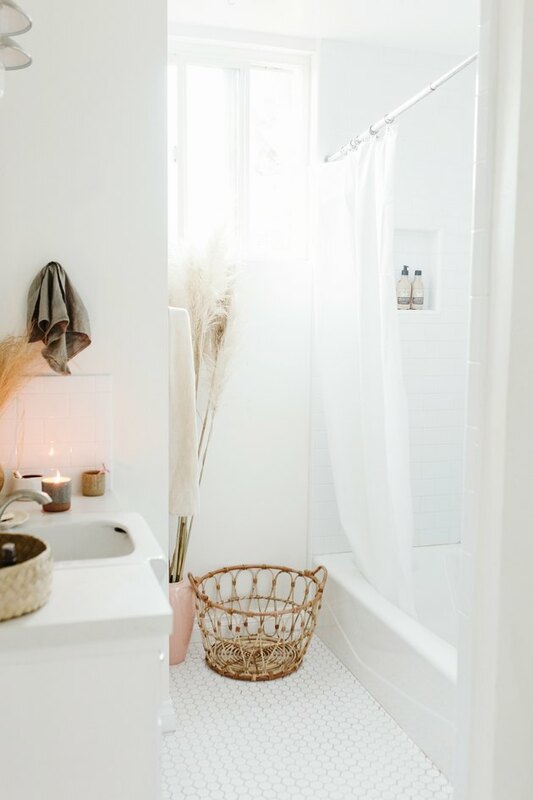 "We traveled around Europe a couple years ago and I fell in love with the simple Nordic design elements seen throughout all the homes we stayed in," Leah says. 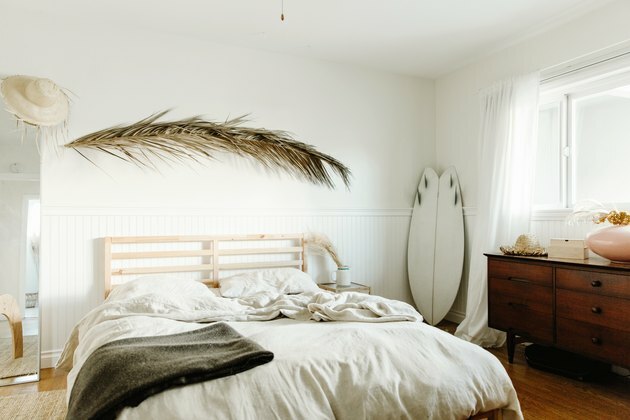 "I have loved incorporating these simple pieces, like our raw wood sofa and shelving unit, but since we are beach people I've also added in touches of linen and natural elements like the palm frond above our bed." 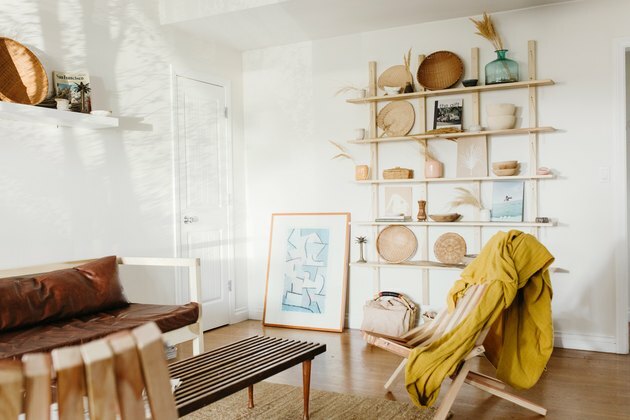 Leah describes her look as minimal and not cluttered — something she's achieved through a refreshing mix of custom furniture, IKEA, souvenirs, and select pieces from her own shop. And, of course, the beach. "Almost every day you can find us on the beach so keeping our home simple and full of pieces from our second home — the beach — is exactly who we are." The 1,100-square-foot townhome has vaulted ceilings. "Our home was built in the early 1950s, so from the front yard's wooden fence design to the floor to the bathroom tile flooring, a bit of midcentury style is seen throughout the home," says Leah. The mustard blanket on the chair, from The Holidays, is by Kyst Collective. The honeycomb floor is original. The basket is from IKEA. The white tile in the kitchen was added "to make the space a bit more modern," she says. They also added the cement over the brick fireplace. It's Leah's favorite room in the house. 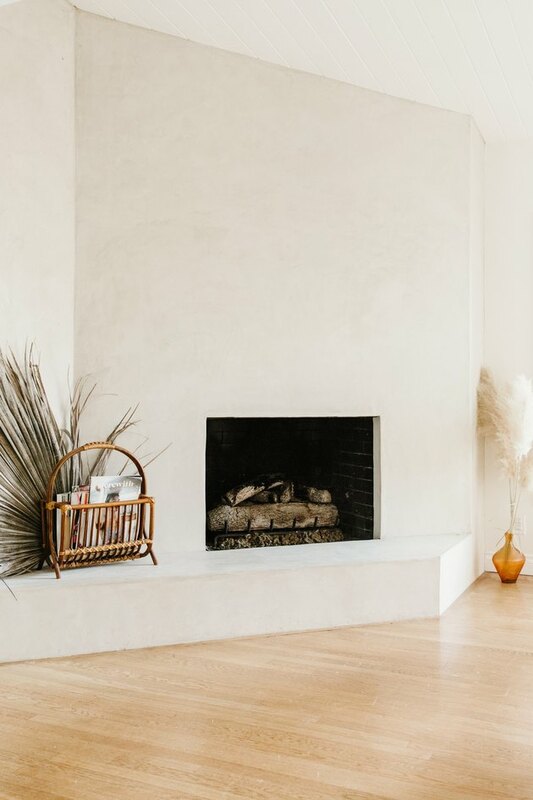 "It seems so grand with the vaulted ceilings yet is so peaceful and inviting with the natural wood furniture and beautiful cement fireplace," she says. The wall hanging in the living room is by Upton. Another Upton print hangs in the kitchen. The custom shelving in the living room is by Kaleb Redden, a friend who goes by @thecrankycarpenter on Instagram. It's made of poplar and cotton rope. 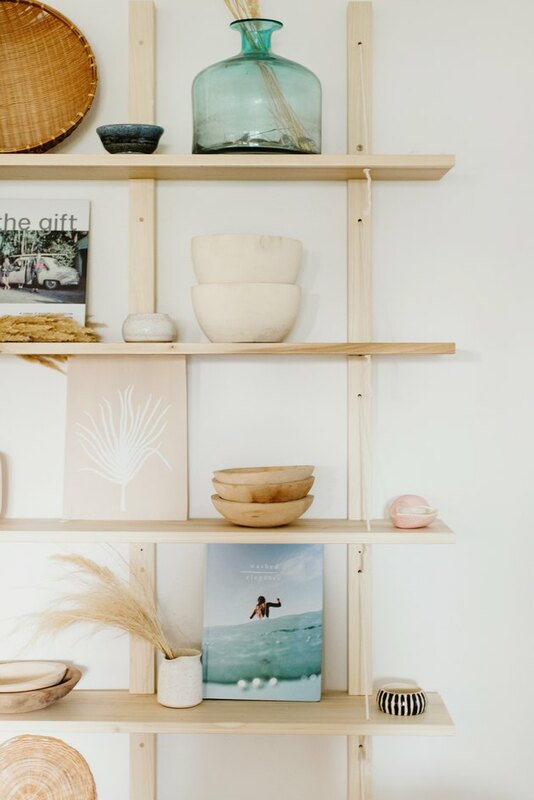 The shelves are filled with mementos from trips and work from local artists. "It's always amazing to have a story behind each piece that is placed around the home," she says. In the master bedroom, Leah paired basics from IKEA with a vintage dresser and French linen bedding from Dazed but Amazed. And a surfboard, of course. 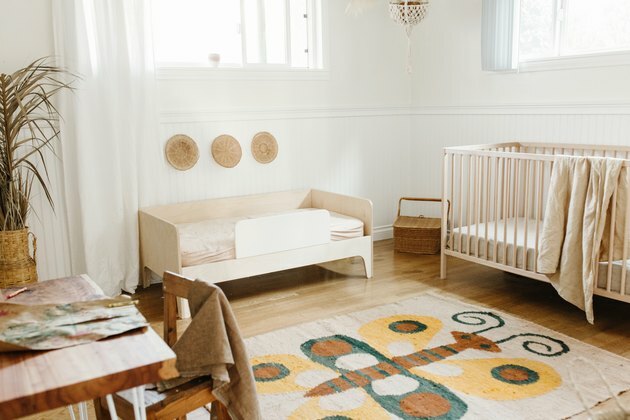 In the nursery, a vintage rug anchors the space shared by the Bradley's 4-month-old son and 2-year-old daughter. The crib is IKEA and the toddler bed is Oeuf. The bedding is Kyst Collective. 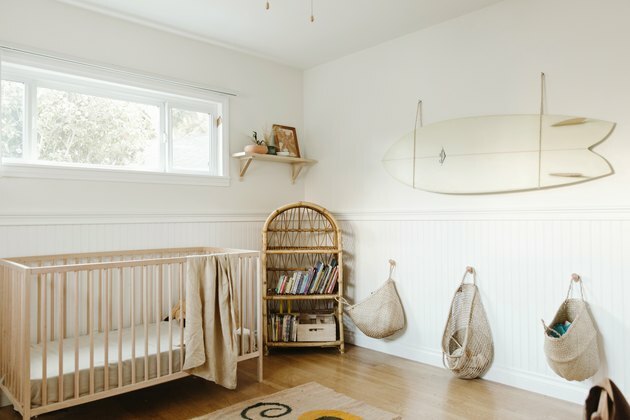 Another surfboard hangs in the nursery. Despite the comforts of their home, the Bradleys spend a lot of their time outdoors. Favorite piece of design or architecture in your neighborhood, town, or city: We have a spot called the Environmental Nature Center around the corner from our house. It was established in the '70s and is a little hidden nature preserve full of beautiful trees and a river for the kids to play in. Even though there is nothing fancy about this spot, it's somewhere I've been inspired by time and time again. I'm so inspired by spending time outdoors. Best place to experience art and culture Main Beach in Laguna Beach — there are so many amazing art galleries. If I were to have visitors, I would take them to ... Our secret cove beach not too far down the road from us! Living the Dream: Calling This Ojai Hacienda a "Second Home"